This is the latest in a series of Quimbee.com case brief videos. Have you signed up for your Quimbee membership? The American Bar Association offers three months of Quimbee study aids (a $72 value) for law student members. And if you go Premium, you’ll receive Quimbee Legal Ethics Outline (a $29 value) as part of our Premium Legal Ethics Bundle. Ready to go all in? Go Platinum and get 3 years of unlimited access to Quimbee and 3 years of ABA Premium membership (nearly a $1,000 value) for just $499. Few acts of protest incite the kind of visceral reaction that burning an American flag does. And when Gregory Lee Johnson burned a flag in protest outside the Republication National Convention in 1984, it certainly provoked a reaction. Johnson was arrested and charged with desecration of a venerated object, which was a criminal offense in Texas. The state convicted Johnson and sentenced him to a year in prison, as well as a $2,000 fine. But the Texas Court of Criminal Appeals reversed the conviction on First Amendment grounds. The United States Supreme Course took up the case to decide whether states could criminalize flag burning. A five-justice majority of the Court held that flag burning is expressive conduct that warrants First Amendment protection. The Court reasoned that a state law attempting to criminalize the activity amounts to a content-based restriction on speech. This meant that flag-burning restrictions could survive constitutional scrutiny only if the state could articulate an interest unrelated to restricting expression. Texas could not do so. 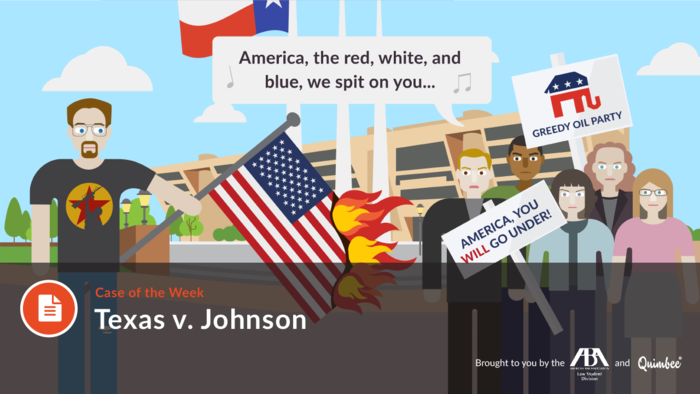 Texas v. Johnson, 491 U.S. 397 (1989), was a landmark victory for free speech. Nevertheless, the issue remains hotly contested. As recently as 2006, Congress very nearly succeeded in amending the Constitution to ban flag burning.